Nana’s Finger Jello is possibly the easiest – and ask my menagerie, the most delicious! – thing to come out of my kitchen. Any dessert that takes just five minutes and three ingredients to prepare is a winner in my book. Original content posted November 2017. Updated January 2019. My mother-in-law was made to be a grandmother. 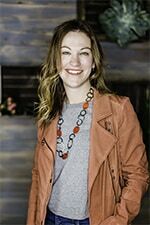 I’m convinced it was her calling in life. Never have I met someone more positive or more patient in my entire lifetime. The wishes of my four children are often granted by their amazing Nana. 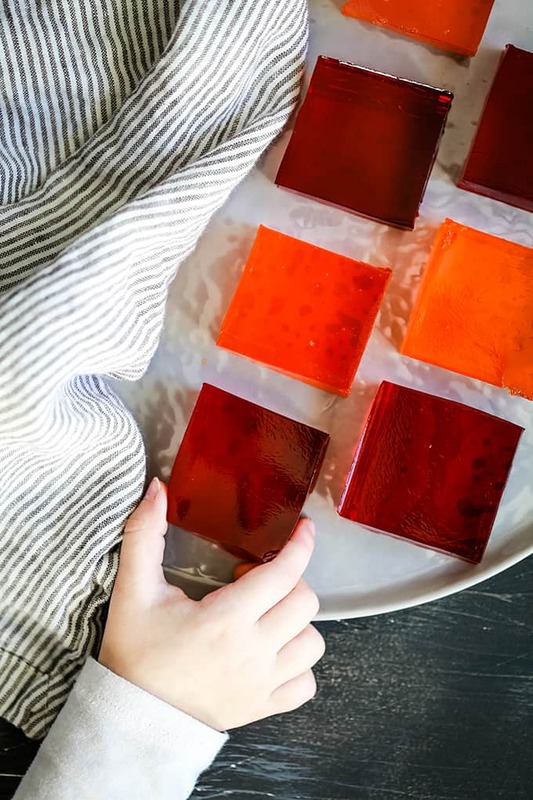 The fact that she will not only make her infamous Nana’s Finger Jello in the requested colors of her grandchildren and then transport it to our home in a cooler on a 14 hour car drive… friends, that pretty much makes her a saint in my book. In case you have any doubt about Nana’s recipe credibility, she’s also the genius behind my popular Homemade Chocolate Pudding Pie, pantry staple Homemade Oatmeal Muffin Mix and my favorite Soft and Chewy Ginger Cookies. In other words, Nana’s Finger Jello is legit! Now, I’m going to be honest and say that Jello of any sort isn’t really my jam. The wiggly texture just messes with my head. But Nana’s Finger Jello? So much better than any other type of jello you’ve tried before. Although still wiggly, these thick squares are more substantial and are easily handled by little and big hands alike. They’re also quickly devoured by anyone who swipes a square. Does Finger Jello Need To Be Refrigerated? YES! For the finger jello mixture to set, it must be refrigerated. Obviously, the longer you allow it to initially set, the more firm your jello will be. I typically let Nana’s Finger Jello recipe to set for two to four hours before attempting to cut it. Nana’s Finger Jello is possibly the easiest – and ask my menagerie, the most delicious! – thing to come out of my kitchen. Any dessert that takes just five minutes and three ingredients to prepare is a winner in my book. 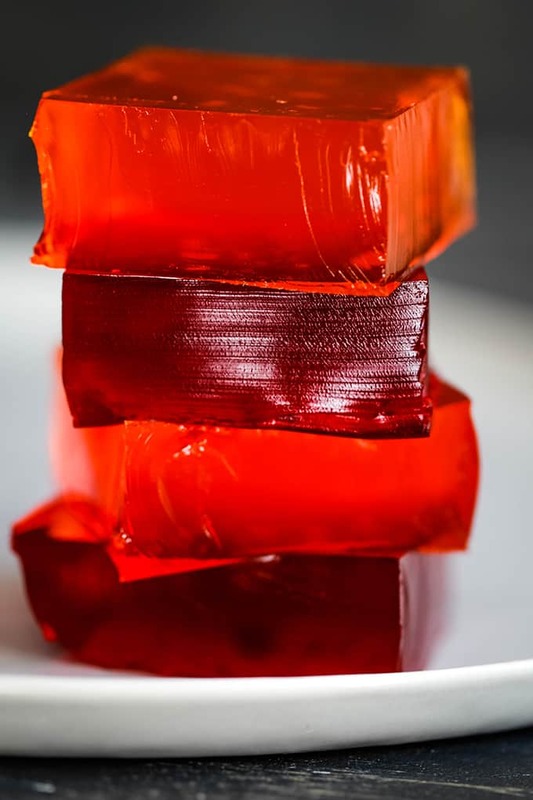 Jello, Knox gelatin and boiling water are whisked together to create this classic treat. In a large bowl, add boiling water. TIP: I like to use a bowl with a pouring spout to easily pour the finished jello mixture to a baking dish as noted in the last step. Much less mess this way! Add Jell-O and Knox gelatin. TIP: To avoid foam or bubbles on the top of your finger jello and insure a clear end product, stir or whisk gently to combine. Because the water is boiling, you do not need to be too aggressive to insure everything is completely dissolved. Carefully pour mixture into 9×9 baking dish. Refrigerate until set. 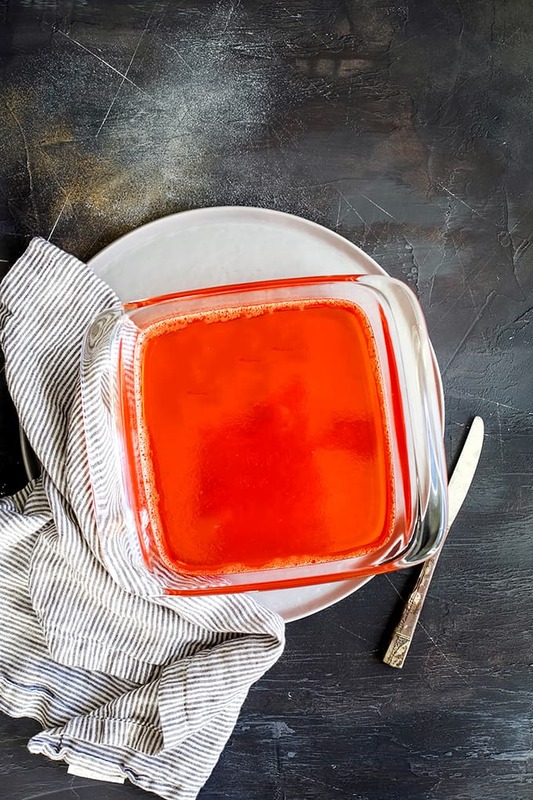 TIP: After the finger jello is set, you’ll want to cover the baking dish either with a lid, plastic wrap or something similar. If you do not, your finger jello is libel to take on the tastes of other items in your fridge. Nana’s Finger Jello never lasts long enough for me to contemplate how I will serve it. In fact, as soon as it’s cut into squares, little hands begin helping themselves! 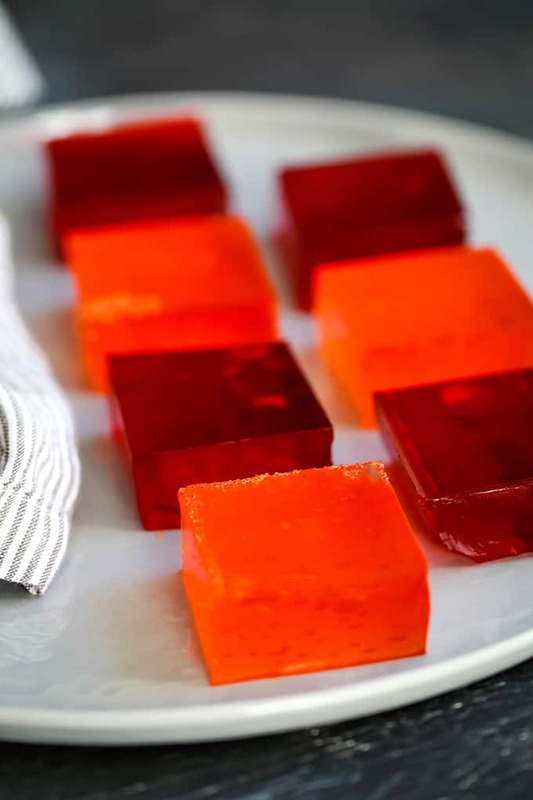 Finger jello is a great side dish for a meal when little taste buds might not be so excited. It doesn’t matter what else is being served, they’ll happily eat whatever we’re having for dinner if that means they can have another square. If you’ve tried this Nana’s Finger Jellor or any other recipe on Melanie Makes, please let me know your thoughts in the comments below. I love hearing from you and respond to each and every comment! Stir or whisk to combine, insuring no lumps of dry powder remain. Carefully pour mixture into 9×9 baking dish. 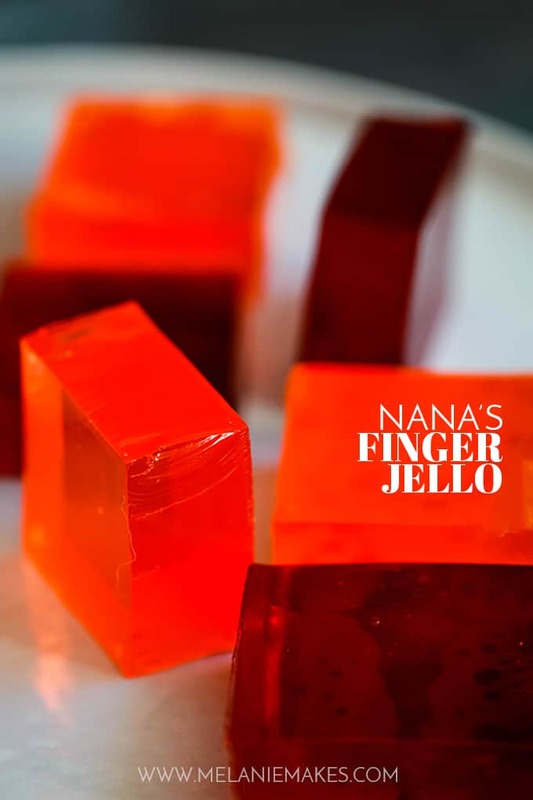 Nana’s Finger Jello is great as a snack or dessert and jello can be served at almost any time of day. These Creamy Raspberry Jell-O Parfaits would make a great dessert, or serve jello as a side dish like this Sea Foam Salad and a perfect ROYGBIV treat ideas with these Rainbow Ribbon Jello. I would like to pour some in molds. I’m wondering if I need to spray the plastic mold? Does anyone know? Hi, Annette - I've never made this finger jello in a mold but I'm guessing you would want to spray it with something. Let me know how it turns out! 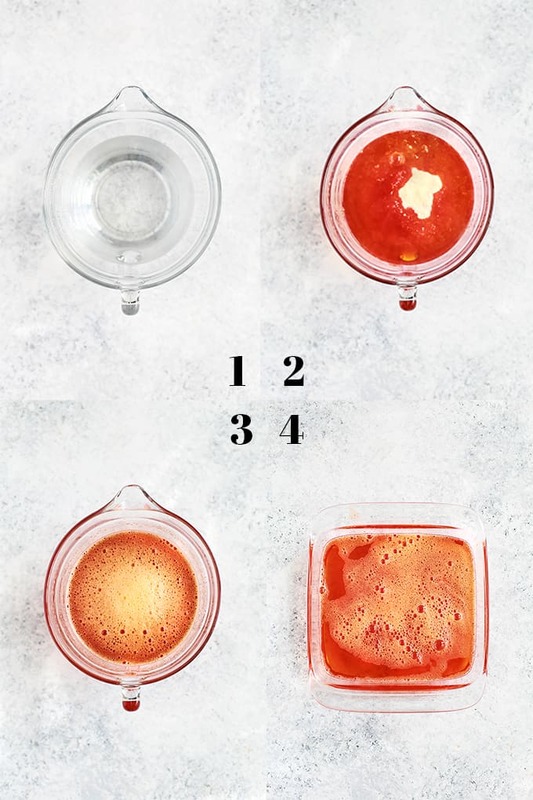 Can you use sugar free jello to make this?Also for the regular recipe can I substitute fruit juice for the water? Hi, Tami - I haven't tried it with either of those substitutions. If you do, let me know how it goes! Are these 6 oz boxes each or combined that equals 6 oz. ? Hi, Mickey - You need two 6 ounce boxes - so 12 ounces total. Hope that helps! I've never had finger jello! I need to try it soon! This reminds me of my childhood! So easy and yummy! Crazy easy, Dee! My kids won't any other kind! This reminds me of happy childhood days!!! Delicious! I haven't had this in years! Thanks for the reminder that simple recipes can bring back happy memories! Love this recipe! Jello is perfect for me when I am craving sweets! It's light and not going to hurt my diet, and satisfies my craving at the same time! I'm sure you'd love this finger jello, Beth! Nothing better than jello on a spring day! 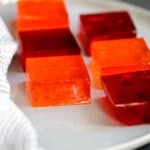 My kids love jello; makes them feel like little chefs! This is just the perfect treat for little hands! They love to jiggle them around on their plate before eating them. I love that Nana will bring this goodness for your kids on a long car ride and will make their requested colors. SO sweet! Also, my daughter would adore this, and we're going to make it during the holidays. You're so sweet, Erin - thank you! My kids - ranging from 9-2 - all go crazy for this jello. You could also easily cut it into shapes as well if you really wanted to go all out! Looks so fun! My kids would love it! I have no doubt they would, Allyson! Those colors are just beautiful! Yup, still stuck on the colors. LOVE! Pretty sure my boys are going to flip over these! So simple, yet so tasty and fun!! I bet they'd love this jello, Jen! My family will love these! I haven't made them in a long long time! Hope you'll give it a try, Dorothy!